Atmospheric processes and energy exchanges are driven by Earth's energy balance and linked to climate and weather. Hurricanes, thunderstorms, tornadoes, blizzards, ice storms, dust storms, heat waves, as well as flash flooding resulting from intense precipitation, are all natural processes that are hazardous to people. These severe hazards affect considerable portions of Northern America and are responsible for causing significant death and destruction each year. 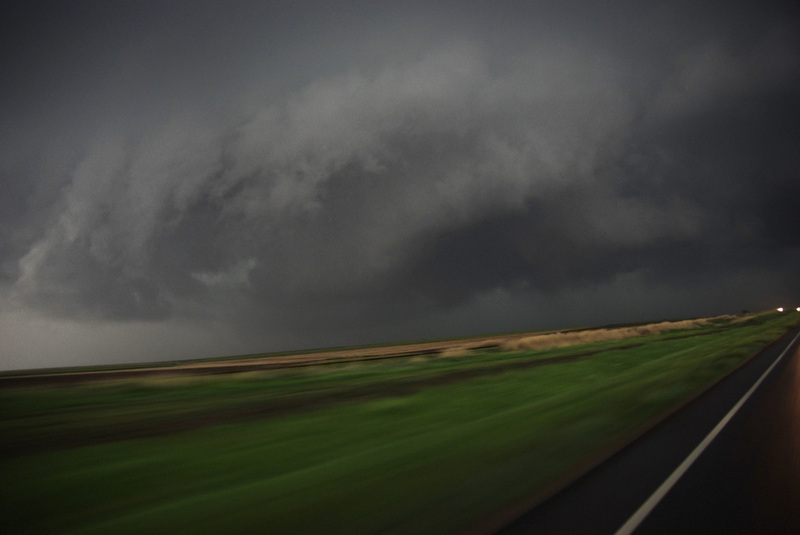 But in order to understand topics such as thunderstorms, tornadoes, lightning, and hurricanes, we need to spend some time looking at the basics of weather. The Sun is the driving force of our weather and climate. Its diameter is about 865,000 miles or 109 Earths lined up side by side and is so large that it makes up 99.99 percent of the mass of our Solar System. Our star - the Sun - is the most common type of star in the universe and has existed for nearly 4.6 billion years. The composition of the Sun is about 92 percent hydrogen (the lightest element in the universe) and almost 8 percent helium (the second lightest element). Using these elements, the Sun generates energy through a process called thermonuclear reaction. This energy is created when the Sun fuses together hydrogen atoms to make a heavier element called helium. This process not only creates new elements, but also releases an enormous amount of energy. The sun's life expectancy is already half over and in another 4 billion years it will consume all the hydrogen within it leaving behind helium and a few other newly created elements. When the hydrogen runs out, in about 5 billion years, the sun will grow into a red giant, expanding its diameter well past Mercury and possibly Venus and Earth. The sun will continue to fuse helium into carbon until it begins to release its outer layers to form a planetary nebula. Left behind will be the white hot core of our star, called a white dwarf, that will slowly fade out over billions of years. Why would you want to wear a black shirt in the winter and a white shirt in the summer? Or would you rather walk barefoot on black pavement or grass? This relates to the idea that different objects absorb and reflect energy differently on the planet. Dark objects tend to absorb more energy, whereas lighter objects reflect more energy. The percent of energy an object reflects is an object's albedo. Because the planet has so many different albedos (cities, forests, deserts, oceans, rocks, glaciers, etc. ), the planet has uneven heating on the planet. The result is that of all the energy the Earth receives from the Sun, only 51 percent is actually absorbed by the planet while 49 percent is reflected back into space. Uneven heating of the planet also occurs because of the curvature of the Earth. The planet receives most of its energy near the equator where the Sun's rays are directly (or nearly directly) hitting the planet. As you move toward the poles, the Sun's energy becomes more diffused and spread out over a greater area. Ultimately, the equator receives more energy from the Sun than it can radiate back into space. There is a surplus of energy. At the poles, the planet radiates more energy out into space than it receives from the Sun. There is a deficit of energy in these regions. The ultimate purpose of weather is to transfer the surplus of energy and heat to the poles and bring colder air toward the equator and find equilibrium. If the planet is trying to balance the extremes of the poles and equator, how is heat transferred around the planet? There are four ways: conduction, convection, latent heat, and radiation. 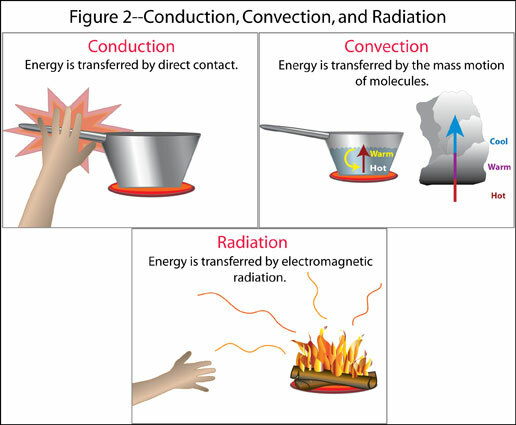 Conduction is the transfer of heat from a warmer object to a cooler object through molecule interaction. As the Sun heats the ground, energy is transferred to the atmosphere by conduction. But the atmosphere is a very poor conductor of heat. In calm weather, the heated ground only warms the first few centimeters of air. In fact, the atmosphere's temperature can be 50 percent colder at your head than near your feet. Since the atmosphere is such a poor conductor of heat, there must be other ways to transfer the energy. Convection is the transfer of heat by the mass movement of a fluid (such as water and air). It occurs mostly in liquids and gases because they are free to move around. Heat is transferred upward and outward away from its heat source and cooler air is brought in to replace the rising air. On a local scale convection in the summer can produce afternoon thunderstorms, but on a global scale convection transfers energy from the equator toward the poles and back. The final process of transferring heat around the planet is called radiation. The energy coming from the Sun comes in various wavelengths. A wavelength is the distance measured along a wave of energy from one crest to another; the shorter the wavelength, the higher the energy. 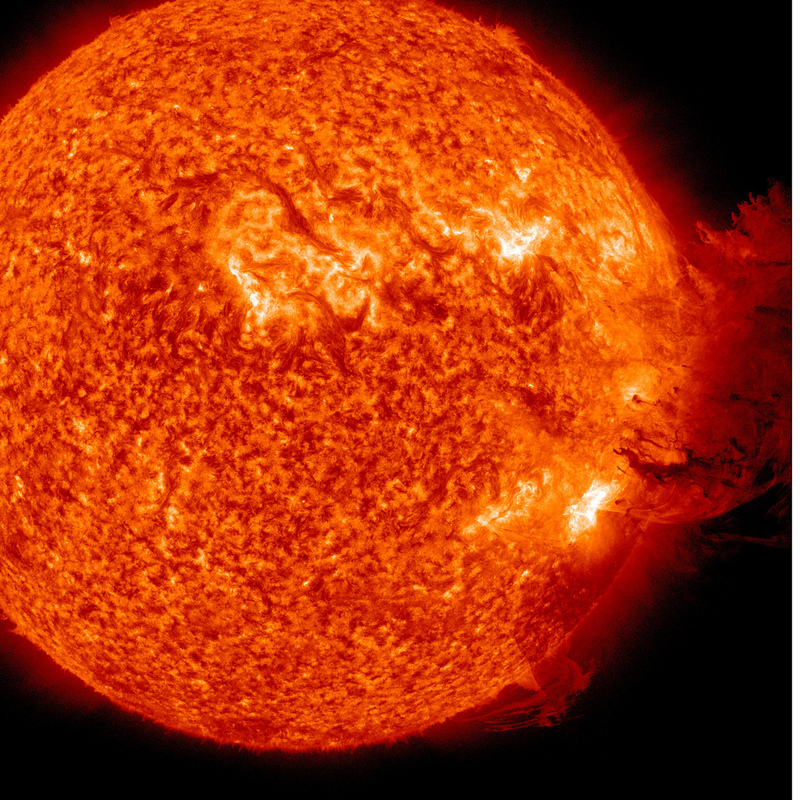 The energy received from the Sun passes through the atmosphere without warming it. But all objects that absorb radiation from the sun radiate some of that energy back out in a weaker form of energy called long wave radiation such as heat. All living objects (including humans) radiate longwave radiation. The Earth itself radiates the energy absorbed from the Sun in the form of longwave radiation which is sometimes called Earth light. If you were an astronaut wearing infrared goggles, you would actually see the earth glowing from the radiating infrared radiation. Latent heat, also called a phase change, is a powerful force in weather. When water transforms from gas to liquid or solid (or vise versa), it is called a phase change. The heat required to change phases is called latent heat. In order for water to change from a liquid to a gas, energy/heat must be taken from some external source such as the surrounding atmosphere. Therefore, evaporation is a cooling process because the water is taking heat from the surrounding air in order to evaporate. With the image above, visualize that everytime evaporation or condensation occurs, there is a direct transfer of heat and energy. The process of evaporation and condensation transfers large amounts of heat around the planet. The heat released in a typical thunderstorm is equal to an atomic bomb. The heat/energy within a hurricane is equal to 100,000 atomic bombs and could power the United States for over a year! There are several controlling factors that determine global temperatures. The first and most significant is latitude. Because of the Earth’s shape the angle of the Sun hitting the planet, temperatures are greatest near the equator and decrease toward the poles. In fact, at the equator more energy is absorbed from the Sun than is radiated back into space. At the poles, more energy is radiated back into space than is absorbed by the Sun. The purpose of weather and ocean currents is to balance out these two extremes. The next control of temperature is the distribution of land and water on the planet. 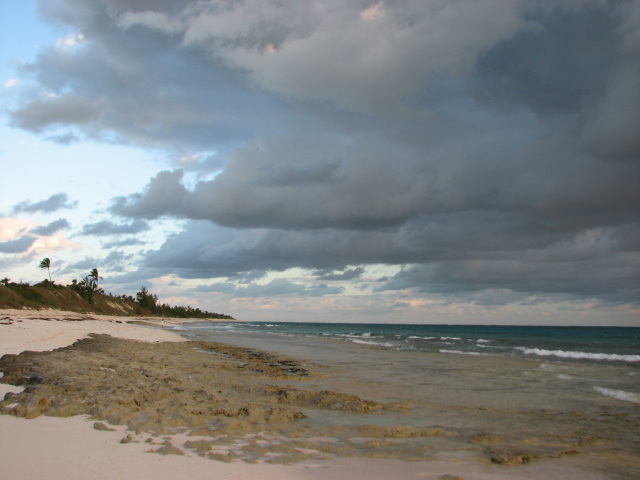 Places near the ocean tend to have milder climates year-round versus regions surrounded by land. This is because the earth can heat up and cool down faster and greater than the ocean. The reason is because sunlight must heat a larger volume of area in the ocean because light can pass through water. Water requires 5 times more energy to heat up than earth, called specific heat. Thus, region’s temperatures located near large bodies of water temperatures change slowly compared to land. Ocean currents are also vital controls in transferring heat around the planet. 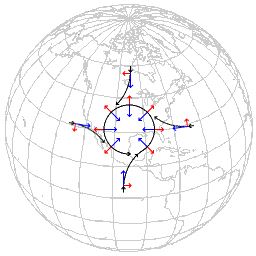 In the Northern Hemisphere, ocean currents rotate clockwise bring cold water from the North Pole toward the equator and warm water from the equator toward the North Pole. The opposite occurs in the Southern Hemisphere. The last control of temperature is elevation. On average, the air decreases in temperature with altitude about 3.6 degrees Fahrenheit per 1000 feet, called the normal lapse rate or temperature lapse rate. Using the Wasatch Front in Utah as an example, Example in Utah: elevation in Salt Lake City is about 6,500 feet above sea level and the Wasatch Mountains elevations are about 10,000 feet above sea level. That’s a 3,500 feet rise in elevation. If it cools at 3.6 degrees Fahrenheit per 1,000 feet, then the top of the mountains are about 12.6 degrees Fahrenheit cooler. In order for liquid water to evaporate, water molecules must absorb enough energy to break bonds between each other. In order to do this, the liquid water must absorb energy and heat from the surrounding environment called latent heat. If the water vapor absorbs enough energy, they will begin to vibrate fast enough to break their molecular bonds and become individual water molecules or gas. Evaporation is a cooling process because it takes heat from the surrounding environment. The concept of latent heat is really necessary and will come back later on cloud formation and severe weather. The opposite must occur in order for water vapor to condense into liquid water. In order for fast vibrating water molecules to condense into liquid, it must release latent heat to the surrounding environment. Releasing energy allows the water molecules to slow down their vibration and attach to other water molecules to become liquid. But one step is missing. In order for water vapor to become liquid, it needs something to condense onto – condensation nuclei. Condensation nuclei consist of microscopic dust, smoke, salt particles that float in the air and recently bacteria. In fact, it is believed that bacteria make up nearly half of all condensation nuclei. To summarize, in order for water vapor to condense into small liquid or ice cloud droplets, condensation nuclei must be present. Humidity is defined as the amount of water vapor in the atmosphere. There are several ways to classify humidity, but for this course we will focus on relative humidity. Relative humidity is the ratio of the atmosphere’s actual water vapor content compared to the amount of water vapor required for atmospheric saturation at that temperature and is usually expressed as a percentage. If the relative humidity is 25 percent, the atmosphere is only holding a quarter of what it could contain. If relative humidity is at 100 percent, the atmosphere is saturated. There are two ways to change relative humidity: moisture content and/or temperature. If the air temperature, stays the same, but the amount of water vapor is increased or decreased, relative humidity will change. Next, it should first be noted that warm air can “hold” more moisture than cooler air. If the water content stays the same, but temperature increases, relative humidity will decrease. 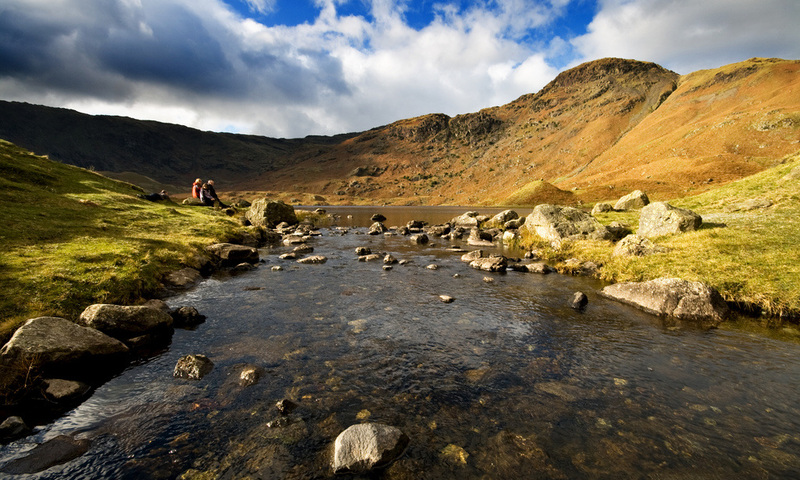 If the water content stays the same, but the temperature decreases, relative humidity will increase. Relative humidity is just as the name implies; it is a relative measurement. A better direct measurement and analysis of humidity is dew point; the atmospheric temperature air must cool down to in order for it to condense into liquid water or solid ice crystals. So if the dew point is 42 degrees Fahrenheit for a particular geographic location at a particular time, then the current temperature must fall to 42 degrees in order for the air to become saturated. The higher the dew point reading, the less air must cool to become saturated. This means the air is quite humid. The lower the dew point reading, the more air must cool to become saturated; thus the air is quite dry. Dew point analysis is vital for weather forecasting in the summer to determine the likelihood of afternoon thunderstorms. If the humidity is high, providing a high dew point measurement, then afternoon convection does not require the unstable moisture to rise as high in order for condensation and thunderstorms genesis occur. 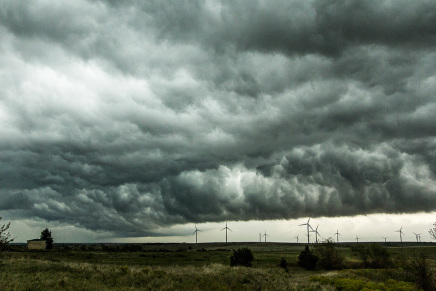 Plus recall that condensation from water vapor to liquid water or ice crystals releases latent heat, a key ingredient for the formation of thunderstorms. There are various elements that control weather: air pressure, atmospheric stability, Coriolis effect, air masses, and weather fronts. Air pressure is a force created by the weight of the atmosphere. Because of gravity, air pressure is greatest at sea level and decreases with height. There is also high pressure and low pressure. High pressure, also called an anticyclone, occurs when descending air molecules "pile up" at the surface and spread outward in a clockwise rotation in the Northern Hemisphere (counterclockwise in the Southern Hemisphere). Descending air warms, which prevents water vapor to condense into clouds to produce storms. Instead, regions under high pressure tend to experience clear skies. Low pressure, also called a cyclone, occurs when converging air is forced upward (in a counterclockwise manner in the Northern Hemisphere) where it cools and condenses into clouds and possible storms. Ultimately, air flows from high pressure to low pressure and this is called wind. If you have high pressure and low pressure, that means there is an imbalance between in air pressure in the atmosphere. The force to balance these two pressure imbalances is called the pressure gradient force, which creates wind. So wind is the horizontal movement of air from high pressure to low pressure to balance atmospheric pressure. In order to have cloud formation, the air must be unstable. Stable air means air does not want to rise up, cool, and condense thus weather conditions tend to be clear skies. Unstable air means the air wants to rise up, cool, and condense into clouds and potential storms. So why does air rise to begin with? Convection occurs when air rises much like a hot air balloon. 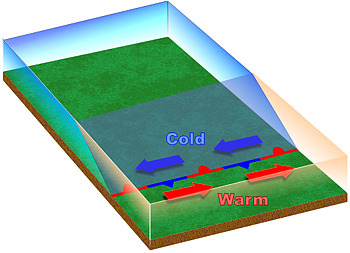 Because of albedo, some areas on the ground can get heated up more than other areas. 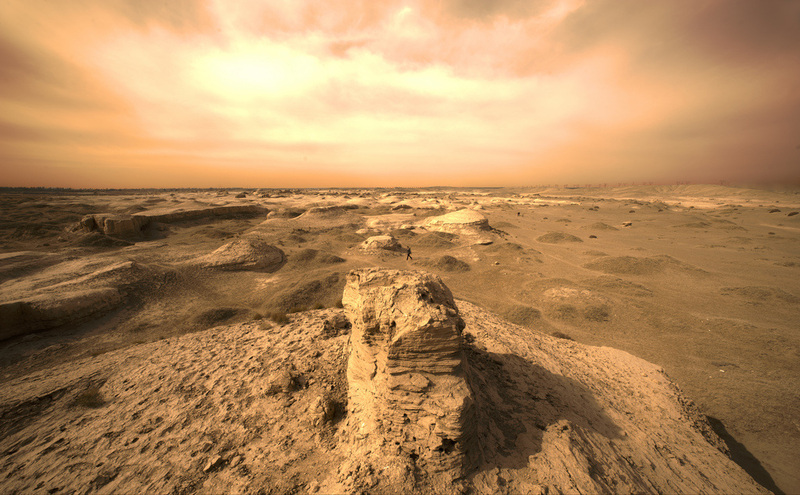 Where the land heats up more, the air above also warms, becomes less dense, and rises. If the air rises high enough, it may cool and condense to create clouds and possible thunderstorms. 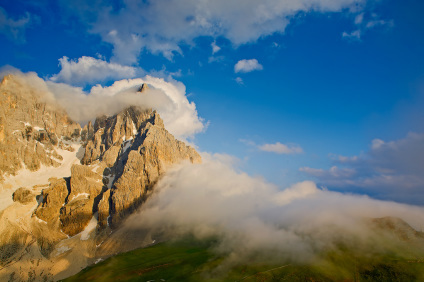 Orographic uplift occurs when air must rise over a mountain range. As the air rises over the mountain, the moisture within it may begin to cool and condense to form thunderstorms. Often times with orographic uplift, one side of the mountain will be very moist from the storms, while the other side is very dry. The dry side of the mountain is called the rainshadow effect. Later we will discuss how this process can generate what is called dry thunderstorms and wildfires. Convergence occurs when air is forced to rise because of low pressure above causing the rising air to cool and condense into clouds. One of the best examples of this is over Florida. Because Florida is a peninsula (surrounded by water on three sides), the land heats up more and the surrounding water. This causes the air above the land to rise. To replace this rising air cool, moist air from the Gulf of Mexico and Atlantic Ocean converges inward over Florida. Now this moist air is heated by the land and is forced upward to create powerful thunderstorms. 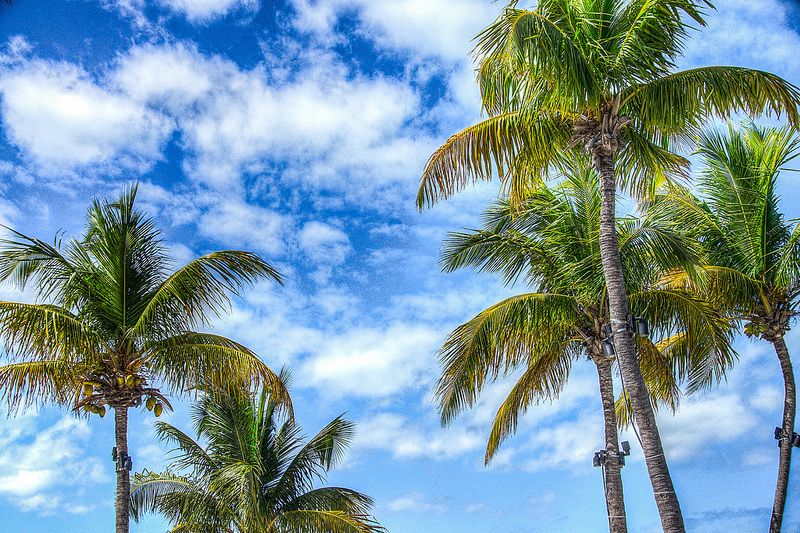 In fact, Florida has more thunderstorms and lightning than any other state in the nation. Another good example of convergence is the eye of a hurricane. 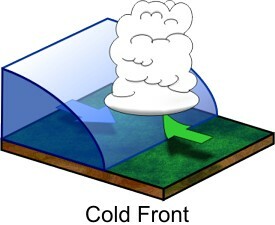 Finally weather fronts, such as cold fronts can force air to rise. 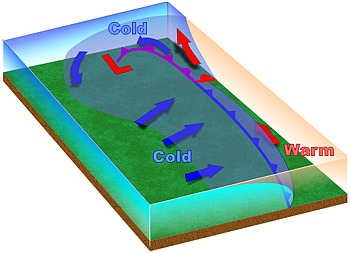 A cold front occurs when a cold, dense air mass is replacing a warm, lighter air mass. The cold air mass plows through forcing the warmer air mass upward where is might cool and condense into clouds. But more on this in a minute. All free moving objects appear to be deflected to the right in the Northern Hemisphere (and to the left in the Southern Hemisphere) because of the rotation of the Earth. This apparent deflection is called the Coriolis effect. Think of it this way. If you wanted to through a football from Salt Lake City, Utah to Las Vegas, Nevada, you could not throw it from point A to point B. Why? Because as the football is moving toward Las Vegas, the Earth underneath is rotating. By the time the football gets to where Las Vegas was when threw the football, the city that never sleeps has moved off. Thus, if you want to throw a football from Salt Lake City to Las Vegas you would need to grow it ahead of the city in hopes that the football and Las Vegas meet up at the same time. Both diagrams of the Coriolis effect were created by Roland Geider and licensed as Creative Commons. Besides a football, what else is considered a "free moving" object. Free moving objects include airplanes, ocean currents, clouds, wind, hurricanes, or anything else that is not attached to the earth's surface. So how does this influence the atmosphere? As winds flow from high to low pressure, it deflects to the right (in the Northern Hemisphere) because of the earth's rotation. This deflection is nonexistent at the equator and progressively gets stronger towards the poles. 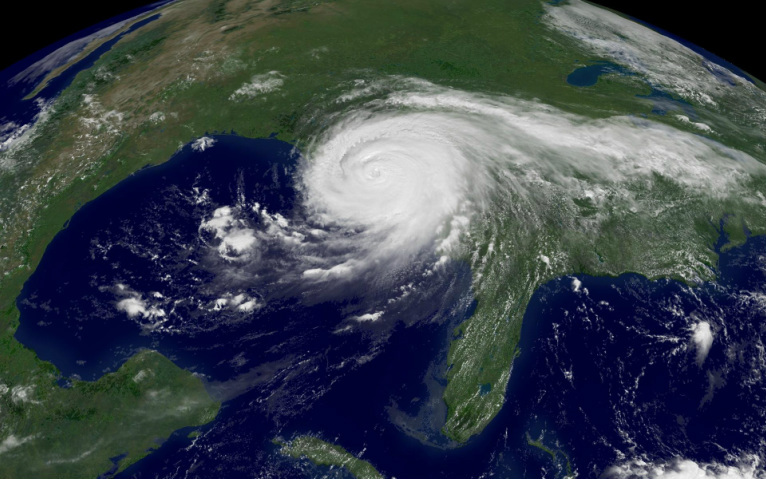 Because of this, hurricanes can only form 5-20 degrees north or south of the equator. Near the equator, the water is warm enough but the Coriolis effect is too weak to make the hurricane rotate. Beyond 20 degrees latitude, the Coriolis effect is strong enough, but the waters are too cold. An air mass is a large body of air covering a relatively wide area and exhibiting horizontally uniform properties of moisture and temperature. The homogeneous of air masses comes from its source region. To create an air mass, the source region's surface must be fairly flat and uniform in composition (i.e. oceans, deserts, glaciers, etc. ), but not a combination. If the air mass stays long enough within the source region, it will begin to develop the characteristics of that source region. An air mass is classified by their temperature and moisture and are identified by using a "letter code" system. The first letter is always lower case and determines the moisture content within the air mass. The second letter is always a capital and determines latitude. A weather front is a transition zone between two air masses of different densities, temperatures and/or moisture. When two air masses come into contact with each other, they do not like to mix well because of their different densities - much like water and oil. Along a weather front, the warmer, less dense air rises over the cooler, denser air to form clouds. There are several types of weather fronts, but we will only focus on two: cold fronts and warm fronts. Cold fronts are zones separating two distinct air masses, of which the cooler, denser mass is advancing and replacing the warmer. The colder, more dense air pushes under the warm air forcing the warm, lighter air upward. If the warm air rising is unstable enough, large thunderstorms are likely to occur. Cumulous and cumulonimbus clouds are common. 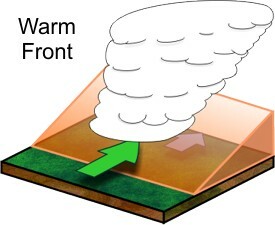 Warm fronts marks the boundary between a warm air mass that is replacing a cooler air mass. When a warm air mass advances over a cold air mass, the warm air rises over, but at a more gentler rate than a cold front. Since the warm air does not rise as fast as a cold front, more stratus clouds form and precipitation is not as heavy. The polar front theory, also known as the Norwegian model, states that cyclones have a fairly predictable, six-stage life cycle. We will focus on the northern hemisphere for this section. It all begins along the polar front at 60-65 degrees north where two very different air masses with different densities meet. Clockwise rotation along the polar high air mass (cold, dense air) and the subtropical high air mass (warm, less dense air) causes air to flow parallel to each other along the polar front but in opposite directions. Where these two contrasting air masses meet is called a stationary front and cyclogenisis (formation of a mid-latitude cyclone) has begun. 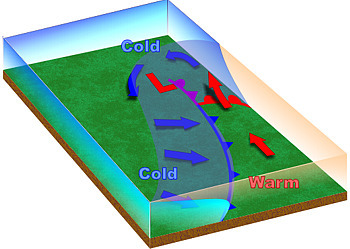 The wind shear, caused by the air flowing parallel but in the opposite direction from each other, creates a wave rotating counterclockwise along the polar front where warm subtropical air begins to migrate northward and cold polar air migrates southward. In the center of this rotating wave develops a low pressure rotating counterclockwise. The advancing boundary of the cold polar air is a cold front and the boundary of the advancing warm subtropical air is a warm front. By stage three the midlatitude cyclone has a defined warm front and cold front. Uplifting of air begins to occur at this stage as the warmer, lighter, and moister air mass is forced to rise over the colder, heavier, and drier air mass. A massive amount of latent heat is being released as water vapor condenses to form clouds. This release of heat strengthens the low pressure (pressure drops more) and the atmosphere becomes more unstable. What would it be like as the midlatitude cyclone approached? If you were in front of an advancing warm front, the air would be cool and stratus-type clouds would begin to develop. As the front approached you, the stratus clouds would lower until nimbostratus clouds were overhead. Typically with warm fronts, the precipitation is light but may last a few days. Once the front passed you, it would actually feel warmer - thus a warm front. If you were in front of an advancing cold front, it would be warm at first with warm, southern winds blowing. Cumulus-type clouds would also begin to develop and lower as the cold front approached. Once the cold front is overhead, expect powerful cumulonimbus thunderstorms with the possibility of lightning and thunder, hail, strong winds, and intense precipitation in the form of rain or snow. Once the cold front has passed by, expect colder temperatures and winds from the north or northwest. As the days move on, the cold front might begin to "catch up" to the warm front and an occluded front forms. During this stage, the cold front forces the rest of the warm air from the warm front into the upper atmosphere. So now before the front passes the air is cool and afterward the air is cold. This is when the storm is most intense, the pressure drops further, and the winds are most intense (indicated by the isobars). But this also marks the end of the midlatitude cyclones life cycle. Once the warm air is forced upward, there is less latent heat thus less energy released into the storm. Remember that weather fronts marks the boundary between two high pressure air masses. So once the midlatitude cyclone moves off, high pressure tends to follow. The results are clear skies, little wind, and pressure rising. NOTE: Make sure to know how each of the weather fronts is drawn on a weather map. Rain is liquid water falling from nimbostratus or cumulonimbus clouds. Many times in the mid-latitudes, precipitation will fall from clouds in the form of snow which melts on its way down toward the ground. Snow is precipitation in the form of ice crystals. The size, shape and concentration of snowflakes depends on the temperature they form in. When temperatures are very cold, snowflakes tend to be small to produce "powder". When the temperatures are warmer the snowflakes are larger. Sleet is precipitation that falls as ice pellets. It occurs when precipitation falls from the base of a cloud in the form of snow. As the snow falls, it enters a region of warm air and melts into rain. But as the rain continues to fall, it enters a layer of cold air and refreezes in the form of ice pellets. 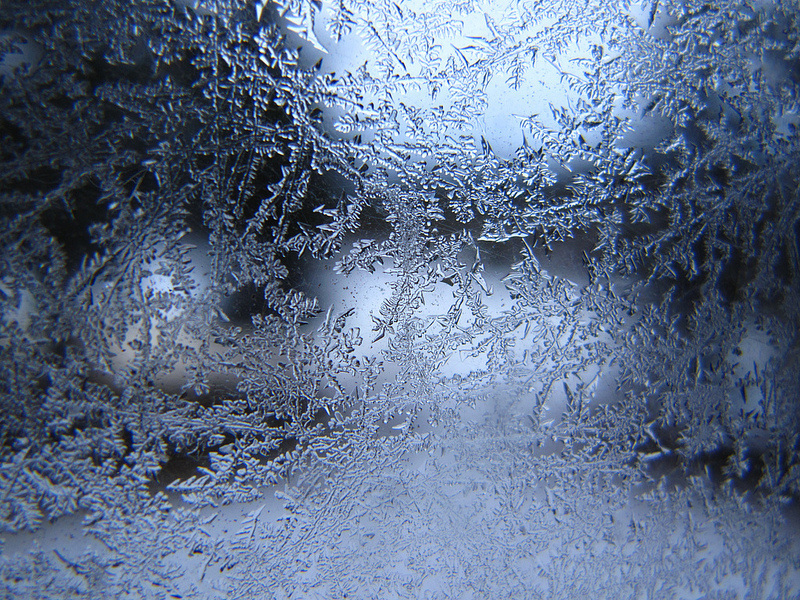 Freezing rain (also called glaze) is similar to sleet except for the last step. As the rain falls, it enters a layer of cold air. But the rain is not in this cold region long enough to freeze. Instead is stays as supercooled raindrops. But once the supercooled raindrops reach the ground, they freeze instantly on any object it touches. 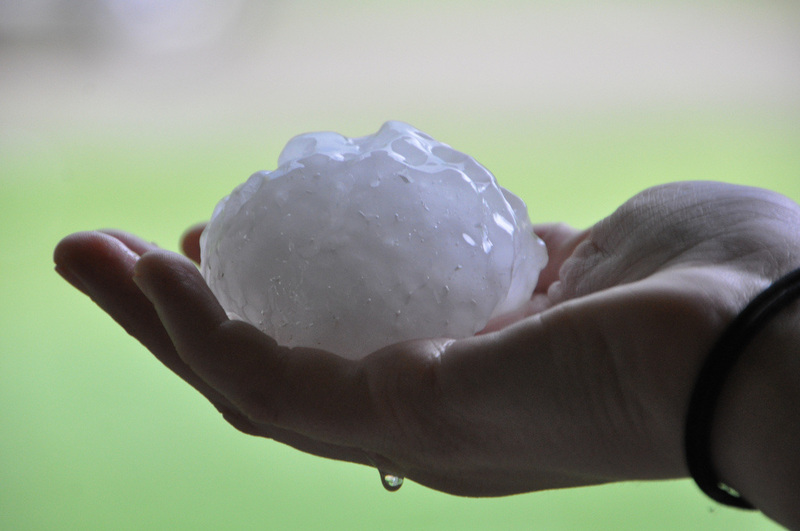 Hail is precipitation in the form of hard pellets of ice and only forms in cumulonimbus clouds where the lower region of the cloud contains liquid water and is above freezing, while the upper region is below freezing. When an ice pellet falls within the cumulonimbus cloud, it enters the warm, liquid region and picks up moisture. Then the updrafts through the ice pellet back up above the freezing point hardening the newly gathered water. The ice pellet will fall again to collect liquid water and thrown back up to refreeze. This process will continue until the weight of the hail stone becomes to heavy for the updrafts to hold it up. Once the hail becomes too heavy, the hail will precipitate from the cloud.